Product prices and availability are accurate as of 2019-04-11 18:00:52 EDT and are subject to change. Any price and availability information displayed on http://www.amazon.com/ at the time of purchase will apply to the purchase of this product. The 11-title Ecology and Conservation Series covers topics from the Greenhouse effect, endangered species to Biodiversity. Students travel across the Globe, examining various species in danger and what is being done to protect them. The Amazon River is extraordinary. Covering over one and a half million square miles, it is home to two-thirds of the world's fresh water and perhaps the greatest diversity of plant and animal life on Earth. 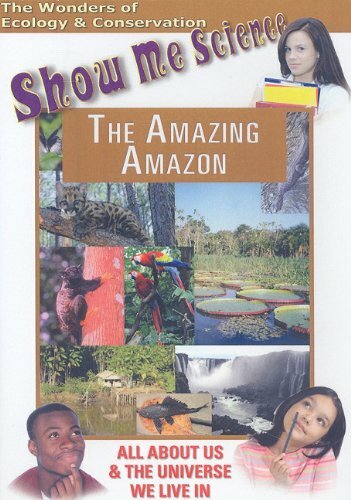 In this episode of Environment and Ecology, students travel the 4,000 miles from the Amazon's beginnings in the Peruvian Andes to its magnificent delta ending at the Atlantic Ocean, while all along learning about its magnificent abundance of life.